Dog owners should be sure to walk their dog at least times a day. However, sometimes there are circumstances that make it so that this is not always an option. This is where the grass pad comes in. It is a no-muss, no-fuss dog toilet that can be used indoors and even on your patio or balcony. Our Pick? DoggieLawn Disposable Dog Potty. Click here to check it out on Amazon. Regardless of their location, grass pads are perfect for those times when your dog has to take his potty break inside the house, as it acts as an alternative to a backyard. Training your puppy or senior dog to use a grass pad is no different than training him on pee pads. Even if you are only planning on using it for emergencies, a real grass pad is probably best, as it will be easier for your furry pal to eliminate outside later on. In fact, some pet parents use grass pads in conjunction with outdoor potty training. This provides a gradual transition from a designated area indoors to the grass outdoors. Also, the combination of pads and outdoor potty training often means less stress on both you and your dog. In this review, I will compare DoggieLawn vs Fresh Patch grass pads and decide which product is better. I will also discuss the benefits of a real grass pad vs the artificial version. I know that choosing a grass pad can be confusing, so to make things simpler, I will point out the differences between these two popular products, and pick my favorite one. You, however, should choose the product that best fits your needs. The DoggieLawn grass pad is an excellent solution for apartments. It is made from real hydroponic grass, which means that it is much the same as normal grass, minus the dirt, bugs, and worms. This grass pad not only attracts dogs, but it also absorbs liquids and neutralizes odors as you would expect from an everyday lawn. While urine is quickly whisked away and absorbed, one thing I should mention about this product is that you still have to pick up solid waste just like you do outside. You will need a bin, a rake and small trash bags, but be sure to remove it quickly after your dog eliminates, or else your house will stink. The DoggieLawn is a complete housebreaking tool, but you can also use it on a daily basis if you own a small or sick dog. If you have smaller pets, such as cats, rabbits or guinea pigs, this is suitable for them as well. Teaching your dog how to eliminate on a grass pad is a simple task, as you can see in this video. But if you need further guidance, you can contact DoggieLawn to set up a personal training call. This pad measures 24″ x 20’’, which makes it twenty-five percent larger than what most other competitors offer. It is, however, best to use it for dogs up to thirty pounds. The cardboard container is firm, leak-resistant and completely disposable so you will not spill or leave messes. Due to its larger size, this grass pad is not the ideal choice for traveling. For that purpose, I actually recommend using one of these best puppy pads. How Long Does Doggielawn Last? One grass pad will last for about two to three weeks, depending on your dog’s size and how often the grass pad is used. Watering the grass pad will certainly help it last longer, but you should throw it away once it begins to turn brown. For this reason, it is very important that you open your grass pads immediately rather than leaving them in a corner of your house somewhere. A few dog owners mentioned issues with bugs, while many others had no such problems. Keep in mind, this is real, fresh green grass, so it will naturally go bad after a couple of weeks. For optimal results, keep the grass inside of the box. The Fresh Patch grass pad was firstly introduced on ABC’s hit television show, Shark Tank, which features a number of potential genius inventions. It is made from real living grass that grows on a hydroponic mat without soil. 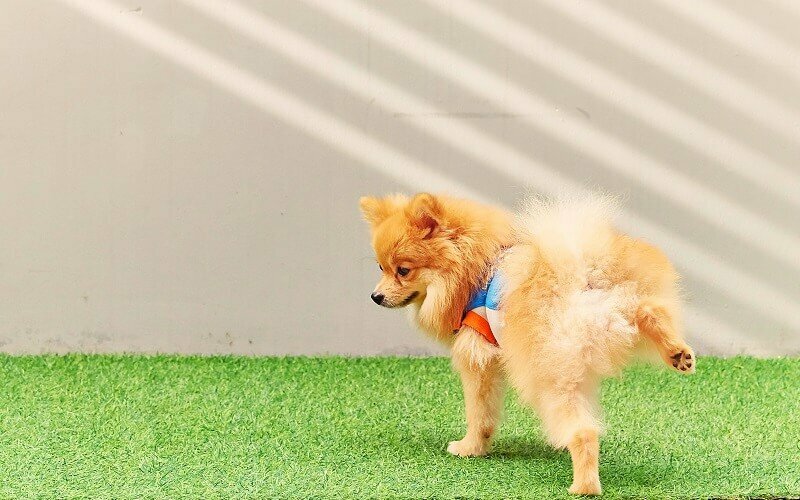 This grass pad naturally attracts your dog, just as a regular lawn would do, and its roots are helpful for absorbing urine, as well as eliminating odors, and keeping messes to a minimum. While this product is great for eliminating urine, be sure to use a scooper to promptly remove any solid waste, as your dog can end up stepping in it and tracking it around the entire house. The Fresh Patch is an excellent choice both for indoor dogs, as well as unvaccinated puppies who cannot yet leave the house. If you also have a cat, this grass pad can replace her litter box in a pinch. In case you are having problems housebreaking your dog, use the company’s free dog training consultants for professional guidance. This pad is lighter than DoggieLawn and as it measures just 24’’ x 16’’, it does not take up too much space. For this reason, it is ideal only for dogs under twenty-five pounds. The cardboard container is sturdy and will not leak or leave dirt behind. Once the product is no longer useful, just throw it away and forget about it. If you need something in a larger size than the standard Fresh Patch box, you can get the extra large grass pad, which is three times larger! However, you will need to purchase a separate tray in order to hold the bigger Fresh Patch grass pad. How Long Does Fresh Patch Last? Just like the DoggieLawn, one grass pad should last for two weeks or even more, depending upon on your dog’s weight and how much he uses it. You should water the grass occasionally, and be sure to replace it with a new one once it starts looking old. Compared to regular sod, which sits on loose soil, Fresh Patch replacement does not cause a big mess. Additionally, some customers claim that sod does not last nearly as long as the Fresh Patch, and turns brown in a matter of days. Some dogs may bite the cardboard container out of boredom. This cardboard is what holds the grass in place, so ideally, it should stay intact. If your dog is a chewer, or you catch him messing with the box, offer him something else to chew on, like a long-lasting dog dental treat to redirect his chewing instinct. You got a new puppy. As much as you want to show him off to the world, it is essential that he gets all his shots before you expose him to the outside. Newspapers are a mess (believe me, I tried). Other choices for protecting your floors during the housebreaking process are either grass pads or puppy pads. Once you decide that you no longer want your dog to eliminate inside, take him out several times a day while reducing the use of indoor pads. Whether it is a hot summer day and the pavement is sizzling or the middle of a raging snowstorm, sometimes you cannot take your dog outside without risking his safety and yours. In that case, having access to indoor potty grass will make things go much faster. Older dogs and dogs with bladder issues by definition cannot hold their needs for a long time. There are also dogs who suffer from arthritis, which means that taking them outside frequently can be hard on their bones. Dogs who have just had surgery may have trouble with stairs and frequent walks too, as they need time to rest to recover. For these situations, it is smart to have a grass pad available indoors. If your full-time job takes up most of the time in your day, or you are occupied with other things, taking your dog for a walk more than once a day, if any, can be a problem. However, you should ask or hire someone to help you out every time you are away for a long time, even if you have a grass pad nearby. People who live on higher floors may not be able to take their dog outside in time. In these apartments, you can wait minutes until an elevator arrives. Some dogs cannot hold it for too long. That includes untrained puppies, elderly and ill dogs, as well as toy dogs who have small bladders. Owners with smaller dog breeds often prefer to use indoor potties, since smaller dogs have to go outside more frequently. Having a grass pad can take some of the pressure off. Not everyone wants their dog to do his business inside the house, and that is very understandable. Some owners prefer to use the grass pad outside in their the balcony or patio. In that case, I suggest installing a pet door so that your dog can get in and out by himself. On a hot day, be sure to remember to spray the grass with a little bit of water so it can last longer, and do not let it sit in the rain, or you will almost certainly have to buy a new dog porch potty. Why It is Better to Go with Real Grass Pads? Since there is actual soil beneath it, a real grass pad can absorb urine and lock nasty odors inside, leaving behind only the natural smell of earthy, wet grass that attracts dogs. A real grass pad is eco-friendly, not only because you only need to replace it every two weeks, but also because it can be composted instead of being thrown away. Some dogs can be quite particular when it comes to choosing their potty spot. A real grass pad looks and smells like the good old grass in your neighborhood, so your dog should instinctively use it to relieve himself. What Is the Problem with Synthetic Grass Pads? Synthetic grass products usually come as a three-piece system, including a collection tray at the bottom for handling the urine that drains through the artificial grass mat. Most of the time, the urine stays on top, and your dog will step on it, resulting in paw pee marks on your floor. Fake grass products usually do not come with a built-in attractant. And even when they do, it is still not as good as the real thing. However, if you already have an artificial grass product, use wipes or paper towels to sop your dog’s accident and leave it on the pad for him to sniff. For starters, you will have to empty the collection tray at the end of each day. Once the grass pad begins to smell, you will then have to wash it with soap and warm water, then wait until it dries. With real grass, all you need to do is simply throw out the grass box after a couple of weeks and open up a new one. Grass pads are like having a little dog park in the convenience and comfort of your own home. Unlike synthetic grass counterparts, real grass pads are cleaner, more efficient, and require less work. The notable difference between DoggieLawn and Fresh Patch is the pad size. Keep in mind, however, you can always use two dog grass pads side by side or go for an extra large pad if your dog needs the additional space. Do not get me wrong, classic puppy pads still have their place. But with a real grass pad, you can forget about cleaning for as long as three weeks, and it is undoubtedly a natural potty environment for dogs. Finally, be sure to check if the grass looks new and that it is not deteriorating in color to make sure you are getting your money’s worth. How much does a 2′ x 4′ section of grass weigh? The 2′ x 4′ Fresh Patch XL averages 30 lbs. According to the company, Fresh Patch is safe for puppies who have not had their shots yet, just keep an eye out to be sure your puppy does not eat large chunks of the patch which might give him an upset stomach.